You’ll be quite the fungi when you add mushrooms to your party platter! All jokes aside, mushrooms are a lot healthier than you might thing. (The non-toxic ones of course). They are quite tasty too, if you ask me. For years, mushrooms have been used by naturalists and heath gurus for their strong antioxidant properties. Even though they’re actually fungi, mushrooms are lumped into the vegetable category – for both cooking and nutritional value. Mushrooms are also an excellent source of sulfur, which is a huge “forgotten” mineral in the modern American diet. Sulfur is essential for our body’s everyday functions, as it helps reduce the pain and inflammation associated with a lot of muscular and skeletal disorders. It also plays a big role in metabolism, helping your body break down your food and extract nutrients from it. Did you know your skin, muscles and bones all have sulfur in them? Your hair and nails also contain a large amount of sulfur, as does your cartilage and connective tissues. Want to reduce the signs of aging? ‘Shroom it up – eat more sulfur! 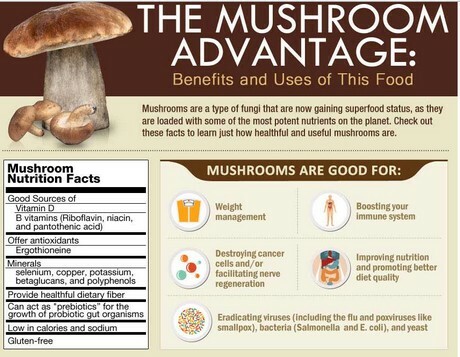 On that note, below is a great infographic from FreshPlaza.com that demonstrates the key benefits of adding more mushrooms to your diet. If they are wrapped in plastic when you purchase them get them out of the plastic ASAP! If they’re slimy, wash them in water and white vinegar. Then, pat dry with a tea towel. Next, place your mushrooms into a completely clean/dry Swag (DO NOT WET THE SWAG) and put in your fridge. If you buy your mushrooms in a brown paper bag, you can nestle the bag in amongst your other Swags. The environment The Swag creates will help them stay alive longer. Wherever possible, buy your mushrooms in brown paper bags – it’s better for the environment and protects you from those toxic plastic bags. Plastic bags and containers kill them quicker, plus you know how we feel about plastic!